Yang Yun was taking part in a free-diving contest at Polar Land in Harbin, north-east China, in which participants were required to sink seven metres to the bottom of a pool and stay there for as long as possible without the aid of breathing equipment. Ms Yun, 26, thought she was going to die amid the beluga whales she shared the arctic pool with, after struggling to move her legs while trying to kick her way to the surface. "I began to choke and sank even lower and I thought that was it for me - I was dead,” she told The Sun. “Until I felt this incredible force under me driving me to the surface." 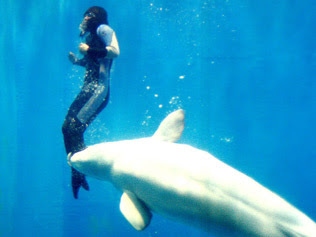 That “incredible force” was Mila, a beluga whale which had noticed her distress and clamped its jaws around her leg. Using her sensitive nose, Mila drove Ms Yun carefully to the surface, to the amazement of onlookers and an underwater photographer who captured the entire incident on film. "Mila noticed the problem before we did,” an organiser told The Sun. "She's a sensitive animal who works closely with humans and I think this girl owes her her life."